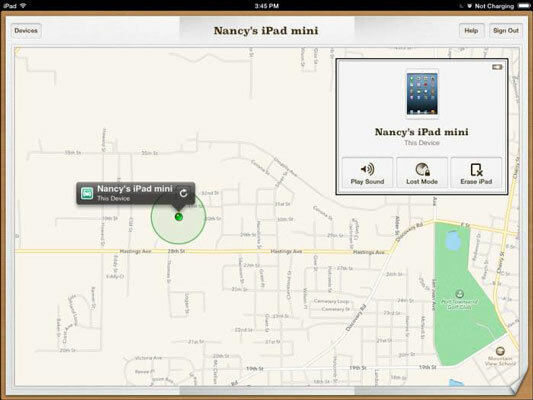 You can take advantage of the Find My iPad feature to pinpoint the location of your iPad. This is a very handy feature if you forget where you left your iPad or somebody walks away with it. Find My iPad not only lets you track down the critter, but also lets you wipe off the data contained in it if you have no way to get the iPad back. In the Settings pane, tap iCloud. In the iCloud settings that appear, tap the On/Off button for Find My iPad to turn on the feature. Tap OK on the Find My iPad dialog (see the figure) that appears. Turn the feature on or off to locate your iPad from your computer. If your iPad is ever lost or stolen, go to http://icloud.com and enter your ID and password. 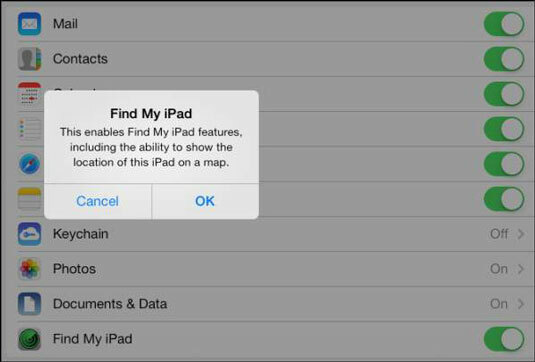 The Find My iPad screen appears, and you can click Devices and click on your iPad to display a map of its location, as shown in the figure. To erase all information from the iPad in a process called wiping, click the Erase iPad button. Remember that this action erases all content, including contacts, music, notes, and so on, for good. To lock the iPad from access by others, click the Lost Mode button. Find My iPad can pinpoint your iPad’s location. You can also tap Play a Sound to send whoever has your iPad a note saying how to return it to you — or a note that the police are on their way if it’s been stolen! If you choose to play a sound, it plays for two minutes, helping you track down your iPad or anybody holding it within earshot.